You know how your favorite song comes on just as you're going into the tunnel? But this is a song you have rocked in many a karaoke frenzy so you have got this! You've got the first 30 seconds or so under your belt and feel like you've got the tempo down. But when you emerge back out into the sunshine, you are half a song ahead of the radio or suddenly it's switched from Livin' on a Prayer to Devo. That's how my blood sugar was last night. Around 2am or so, my sensor lost track of my pump somewhere in the covers (the Minimed is very persnickety about anything being between the pump and the sensor, like Overly Attached Girlfriend). So at 6:30am, it just said LOST SENSOR on the screen. No worries. 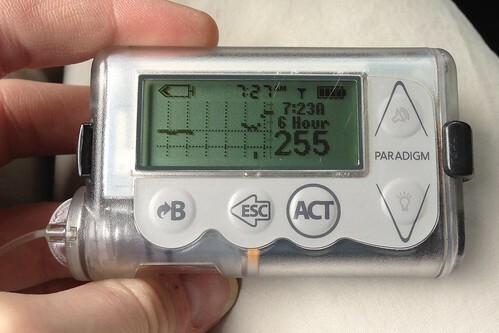 I went to bed with a blood sugar of 77. How bad could it be? 250, you say? Well, we are not men indeed; we are devo-raciously thirsty and annoyed. I think I ate too much watermelon before bed to fix a low blood sugar. But I just feel better when all my gadgets are on the same page.